Spaceport NewsJohn F. Kennedy Space CenterAmerica's gateway to the universe. Leading the world in preparing and launching missions to Earth and beyond. August 15, 1997 Vol. 36, No. 16Mission Update Mission Update Shuttle-Mir STS-86 Atlantis (20th flight) Pad 39A (87th Shuttle flight) Launch date: Under review 7th Shuttle-Mir docking Crew: Wetherbee; Bloomfield; Parazynski; Titov; Chretien; Lawrence; Wolf. Wolf replaces Lawrence as next U.S. astronaut on Mir because she is not qualified for Russian spacewalks. Launch date may slip beyond the originally targeted Sept. 18 date to allow Wolf additional spacewalk training time. By the end of this month, two new NASA spacecraft will be on orbit, one launched from Vandenberg Air Force Base on the West Coast and one from here in Florida. Already successfully carried aloft by a Pegasus XL expendable launch vehicle deployed from a Lockheed L-1011 is the Sea-viewing Wide Field-ofView Sensor (SeaWiFS) instrument on board the Orbital Sciences Corp. (OSC) SeaStar spacecraft. Still to come later this month from Launch Complex 17 on Cape Canaveral Air Station is the launch of the Advanced Composition Explorer (ACE) aboard a Delta II launch vehicle. Liftoff is set for 10:39 a.m. EDT, Aug. 25.Two NASA spacecraft set for launch in August on ELVsSeaWiFS is an Earthobserving spacecraft, while ACE is an astronomical observatory. SeaWiFS: The SeaWiFS project is part of NASA's Mission to Planet Earth Enterprise, a long-term, coordinated effort to study the Earth as a global system. Understanding the role of the oceans in the global carbon cycle the process by which carbon travels through the Earth's atmosphere, oceans, land and living organisms is essential to understanding climate change. The SeaWiFS instrument will study the carbon cycle by observing the world's oceans (See ELVs, Page 8)Center director launches vision of KSC's futureMir 24 crew arrives: Mir 24 Commander Anatoly Solovyev and Flight Engineer Pavel Vinogradov arrived at Mir Aug. 7, joining U.S. astronaut Mike Foale and two cosmonauts. Five-time space flyer Solovyev flew to Mir in 1995 with the STS-71 crew for the first Shuttle-Mir docking. CassiniMission to Saturn : Launch remains on track for Oct. 6 between 5:38 and 7:58 a.m. EDT. STS-87 Columbia (24th flight) Pad 39B (88th Shuttle flight) Target launch date: Nov. 19 First use of Pad 39B since January.Twelve years to the day that astronaut Roy Bridges Jr. piloted the Space Shuttle Challenger on a successful mission from Kennedy Space Center, Center Director Bridges took the stage to unveil a broad, bold plan for the Centers future through 2025. The KSC road map to the future, as drafted by Bridges and the KSC Senior Management Council, envisions a slow and deliberate transition from an operations role to a development role for its civil service work force as NASA proceeds toward privatization of the Space Shuttle and commercialization of other programs. It outlines important roles for KSC in Moon/Mars initiatives and the development of new technologies. These projects are very exciting, Bridges told a standing-room-only crowd in the KSC Auditorium on July 29. They are very demanding in much the same way as are the Shuttle and the (International Space) Station. There are no guarantees of success, only our commitment to go forward and open the space frontier. He maintained that there is a need to go back to our roots why NASA was created . not to do what others can, but what no one else can do such as cutting-edge engineering. Thats what we want to (See FUTURE, Page 6) Bridges BLASTING through the hazy late-morning sky, the Space Shuttle Discovery soars from Launch Pad 39A at 10:41 a.m. EDT Aug. 7 on the 11-day STS-85 mission. Aboard Discovery are Commander Curtis Brown Jr.; Pilot Kent Rominger, Payload Commander Jan Davis, Mission Specialist Robert Curbeam Jr., Mission Specialist Stephen Robinson and Payload Specialist Bjarni Tryggvason, a Canadian Space Agency astronaut The primary payload for this sixth Shuttle flight of 1997 is the Cryogenic Infrared Spectrometers and Telescopes for the Atmosphere-Shuttle Pallet Satellite-2 (CRISTASPAS-2) free-flyer. Other payloads include the Manipulator Flight Demonstration (MFD), a Japanese Space Agency-sponsored experiment. Also in Discoverys payload bay are the Technology Applications and Science-1 (TAS-1) and International Extreme Ultraviolet Hitchhiker-2 (IEH-2) experiments. 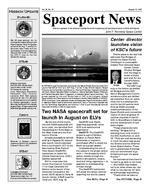 Page 2 SPACEPORT NEWS August 15, 1997 A Technology Awards breakfast was held July 24 in the Space Station Processing Facility cafeteria to recognize NASA and contractor innovators who received Space Act Awards during the past year. Approximately 130 awardees and management representatives attended the breakfast, which was held in conjunction with the centers first annual Technology Transfer Week, sponsored by the Technology Programs and Commercialization Office. Space Act Awards include both automatic and board action awards. Automatic awards include those for patent application, software release to the public, and for having a technical article published in theNASA Tech Briefs magazine. Board action awards include awards for those projects that have been evaluated by the NASA Inventions & Contributions Board at Headquarters and found to have a tangible value to NASA, either through use on the Shuttle program and/ or for having current or potential value in the commercial marketplace. All of these types of awards were represented at the breakfast. Fifty-five projects received recognition, including the Space Shuttles Orbiter Automatic Window Inspection Device, Cryogenic Sampling and SPME Sample Injection Method, Improved Ultrasonic Leak Detector, Automated Calibration Systems at KSC, and Crane Hook Position sensor.AMONG the attendees attending the Technology Transfer Week awards breakfast were employees from NASA, I-NET, Bionetics, United Space Alliance, McDonnell Douglas, EG&G Florida, Boeing North American and Precision Fabricating and Cleaning.Space Act Award winners honoredCenter director initiates new Quality Dollar Award KSC makes CIO-100 listInnovative use of information technology (IT) has earned KSC a place on the CIO-100 list, published annually by CIO magazine. The theme of the CIO (which stands for Chief Information Officer) 100 list this year is innovative IT practices that help to achieve the overall business goals of the organization. More than 3,000 executives across 10 industries were consulted by the magazine to identify this year's top 100 performers in the field of information technology. Nominations were ranked according to five criteria: infrastructure alignment; internal customer support; internal operations; information technology and business alignment, and innovation and learning. The most frequently nominated and highest-scoring companies made it to the final list. These information systems (IS) groups have learned to make substantial investments in managing information and knowledge through collaborative technologies such as intranets and a culture that encourages informa-CIO MAGAZINE can be found at the KSC library located on the first floor of the Headquarters Building.tion sharing, writes Senior Editor Carol Hildebrand in the magazine's introduction to the 1997 CIO-100 list. CIO-100 honorees, such as the U.S. Department of Defense, have invested in systems both technical and organizational that encourage lifelong learning and have created an institutional memory for lessons already learned ... she added. At KSC, Jimmy Akin holds the post of Chief Information Officer, reporting to Center Director Roy Bridges Jr. Other 1997 CIO-100 winners include The Boeing Co., American Airlines, The Coca-Cola Co., Xerox and IBM. On Aug. 4 Center Director Roy Bridges Jr. unveiled and awarded the first issuance of his Quality Dollar Award, which consists of a gold coin and framed certificate, to the EG&G/ NASA Maintenance Management Team. Eighteen members of the EG&G/NASA Maintenance Management Team worked toward sustaining the availability and reliability of facilities and utilities in a cost-effective manner through the use of Reliability Centered Maintenance. The team employed a new process to transition from a reactive maintenance culture to one that promotes proactive maintenance based upon facility condition trending. Since the program began, the team estimates a $250,000 cost savings and $1 million cost avoidance. This gold dollar is awarded to individuals or teams in recognition of their significant contributions to continual process improvement, demonstrated model behavior, or innovative approaches to ensuring customer satisfaction. Bridges said he appreciates the value of recognizing people who make a difference in the way business is conducted at KSC. He told the team, I ContinualProcessImprovementHelpingBuildAmerica'sGatewayToTheUniverseSerial No. 1 For dedication, innovation, and can-do attitude, this coin is gratefully presented to hope you will be a model for others to follow both in teamwork and in the thought you put into the project. Bridges also announced that a silver dollar will be made available for directors to award. THE EG&G/NASA Maintenance Management Team,featured in the May 9 Spaceport News, received the first Quality Dollar Award from Center Director Bridges (left). Page 3 SPACEPORT NEWS August 15, 1997 Space-theme murals brighten hospital wardChildren staying in the Pediatric Unit of Florida Hospital Waterman in Eustis have more than unadorned walls to stare at, thanks to the support of KSC and other Florida organizations. In 1996, the hospital decided to remodel its pediatric unit, which provides treatment for about 470 patients per year, ranging in age from newborn to 17 years. Hospital employees helped choose themes for the redesign, and inspired by a presentation given by the KSC Speakers Bureau, selected the space program as the theme for two of the rooms. Hospital public relations personnel and graphic designers visited the space center, related Management Analyst Cindy Coddington in the Shuttle Process-KSC SHUTTLE Processing Director Bob Sieck (left photo) and the Visitor Complex Space Man attended a ribboncutting for the newly refurbished hospital unit on July 13 in Eustis. This mural (right) depicts a Shuttle launch against a landscape emphasizing KSC's importance as a national wildlife refuge.Workers get SnoopysTwo NASA and three KSC contractor employees were presented with the prestigious Silver Snoopy award in June. Frank Merceret, chief of the Applied Meteorology Unit, was commended for his development of the cold weather temperature recovery algorithm. This was used to ensure that no problems occur due to a cold-soaked booster on cold launch countdowns of the Shuttle. David Adcock, a gas and fluid systems engineer with the Engineering Development Directorate, was recognized for his help in problem solving and resolution of several discrepancies found during manufacturing and activation of the Space Station ammonia system equipment. I-NET employee Ravi Margasahayam was recognized for his role in the development of liquid oxygen pump predictive maintenance techniques, Shuttle floodlight coolant system testing support and ongoing Shuttle launch acoustics analysis. Clyde Parris of I-NET was commended for his contribution to the Shuttle program through reduction of hazardous emissions and hazardous chemical wastes as well as through the reduction in costs of launch operations. Also honored was United Space Alliance worker Kristine Wilson. Astronaut Pam Melroy presented the awards. ing Directorate. We looked over a lot of photos, took tours and brainstormed to come up with the most appropriate space-related themes for the murals, she added. One room features a mural showing a Shuttle liftoff against the backdrop of the Merritt Island National Wildlife Refuge. The other focuses on long-duration spaceflight and the exploration of the solar system. KSC Shuttle Processing Director Bob Sieck made the trip to Eustis and performed the official ribbon-cutting during a ceremony July 13. Also present was the KSC Visitor Complex astronaut. Also contributing to the remodeling effort were McDonalds Corp. and Sea World of Florida.McDonnell Douglas now part of BoeingSome 1,500 Payload Ground Operations Contract (PGOC) employees who formerly worked for McDonnell Douglas are now Boeing employees. The merger of the two aerospace giants became official Aug. 1, with operations beginning Aug. 4. Boeing Chief Executive Officer Phil Condit and President Harry Stonecipher visited KSC Aug. 5. Altogether, about 2,800 employees in Brevard were affected by the latest merger, a figure which includes workers on Cape Canaveral Air Station supporting the Delta rocket program. To further emphasize the creation of a new corporate entity, Boeing also unveiled a new corporate logo that blends elements of the Boeing emblem with that of McDonnell Douglas. Lightning awareness DO you know what the Phase I and Phase II lightning alerts mean? Phase I is the lightning advisory, meaning lightning is expected to occur during the next 30 minutes within five nautical miles of KSC. Phase II is the lightning warning and means lightning is imminent or occurring within five nautical miles of the center: Employees need to take shelter, close outer facility doors and make sure flight hardware is protected. This dramatic photo, dating back to July 1, 1974, was taken prior to the Apollo-Soyuz Test Project (ASTP) launch July 15. August 15, 1997 SPACEPORT NEWS Page 4KSC plays host to team testing innovative range-tracking technologyArmed with antennas rather than cameras, an unconventional band of tourists has appeared at the Static Test Road viewing site for the last three Shuttle launches. Their objective is equally unusual: To demonstrate an innovative method for tracking vehicles during launch. If it proves viable, the technology could help reduce the cost of future range tracking systems. The technology is called Passive Coherent Location (PCL). PCL capitalizes on the energy emitted by commercial broadcast stations, such as radio or television networks. Using a groundbased system of antennas, receivers and signal processors, PCL tracks this energy as it is reflected off an ascending launch vehicle, allowing its ascent trajectory to be plotted. This is a pure research and development effort, observed George Jenkins of Lockheed-Martin Astronautics. Jenkins, who was director of the MILA tracking station at KSC for 26 years, is now a staff engineer with Lockheed Martin, working on a comprehensive Air Force effort called Range Standardization and Automation Phase IIA (RSA-IIA). Lockheed Martin is the prime contractor for this phase, of which the PCL technology demonstration is just one element. In RSA-IIA, the Lockheed Martin-led team members are serving as the architects who will determine the blueprint for the range of the future, not just here in Florida but on the West Coast as well, Jenkins said. While RSA-IIA is an Air Force initiative, it will impact NASA, since the space agency launches on both coasts and relies on range support in such critical areas as weather forecasting, tracking and safety. The range of the future will be called the Space Lift Range System (SLRS). Both the Eastern and the Western Ranges will have the same standardized systems where appropriate. The goal is to be able to support two launches in a day with as little as four hours between them a much quicker turnaround time than can be supported using existing systems. We need to do some new stuff to meet this requirement, Jenkins pointed out. Cost is another driver. The most promising aspect of PCL is its potentially lower cost. The current range system makes use of C-band radar, which is an expensive system to maintain. In an effort to reduce the operations and maintenance costs of the SLRS, PCL is one of the many concepts that Lockheed Martin is evaluating for possible use on the ranges in support of launch vehicle operations, noted Air Force Capt. Soledad Starkey-Quinones, chief of RSA test and integration for the Eastern Range. NASA/KSC has played good neighbor to the PCL demonstration in several ways. At present, the technology is being demonstrated using two mobile homes headquartered at KSC's Electromagnetic Laboratory (EML), and computers located at a Lockheed Martin facility in Gaithersburg, Md. The EML managed by KSC Payload Ground Operations Contractor Boeing (formerly McDonnell Douglas) was a natural choice to host the PCL testing since mobile equipment and vans are part of its launch and landing support repertoire, Jenkins noted. The primary function of the EML is to monitor and control the radio frequency environment on both KSC and the Cape. Specially equipped vans help get the job done. In addition, NASA aircraft here and at Vandenberg Air Force Base, Calif., have served as tracking targets for the PCL demonstration effort. Jenkins and his team also have used the NASA Ponce de Leon tracking station in New Smyrna Beach in addition to the Static Test Road location. PCL technology has been tested during the last three Space Shuttle launches and several expendable vehicle launches. Unlike Cband radar, PCL does not require a transmitter on the vehicle a potential cost-saving factor. So far PCL is showing promise. Comparisons with the prelaunch nominal trajectory and postlaunch C-band tracking data show that the innovative technology is holding its own. Track durations of up to five minutes, position accuracies of five meters and velocity accuracy of one meter per second have been demonstrated, Jenkins said very favorable results. If the Air Force gives the green light, the next step would be to bring to Florida the Gaithersburg-based software needed to compute the vehicle trajectory. NASA resources are being made available at no cost to the agency, noted Dave Phillips, chief of the NASA/Air Force Management and Aircraft Operations Office. We'll continue to serve as a liaison for the PCL technology demonstration effort as well as other initiatives to upgrade the Air Force Ranges, he added. PCL, if successful, could become part of the range tracking system of the future. TOM Ruberto (above left) of Boeing and George Jenkins check out equipment in one of two specially equipped vans (exterior shown at right, parked at Static Test Road the day before the STS-85 launch). Each of the four radio receivers tracks a different commercial broadcast signal. SPACEPORT NEWS Page 5 August 15, 1997 An international team of astronomers has discovered the most distant galaxy found in the universe to date, by combining the unique sharpness of the images from NASA's Hubble Space Telescope with the light-collecting power of the W. M. Keck Telescopes with an added boost from a gravitational lens in space. A gravitational lens is a collection of matter (such as a cluster of galaxies) that are so massive they warp space in their vicinity, allowing the light of even more distant objects to curve around the central lens-mass and be seen from Earth as magnified objects. The results show the young galaxy is as far as 13 billion light years from us, based on an estimated age for the universe of approximately 14 billion years. This would place the galaxy far back in time during the "formative years" of galaxy birth and evolution, less than a billion years after the birth of the universe in the Big Bang. The detailed image shows that bright dense knots of massive stars power this object. Due to the firestorm of starbirth within it, the galaxy is intrinsically one of the brightest young galaxies in the universe, blazing with the brilliance of more than ten times our own Milky Way. We are fascinated to be witnessing the very early stages of the construction of what could well become a massive galaxy like our own Milky Way, said Garth Illingworth of the University of California, Santa Cruz. This object is a pathfinder for deciphering what is happening in young galaxies, and offers a rare glimpse of the powerful events that transpired during the formation of galaxies. Most distant galaxy in universe is foundTHE galaxy discovered by the telescopes (in box) is so far away that its light is only reaching us now from a time when the universe was but 7 percent of its current age of about 14 billion years.This places the young galaxy as far as 13 billion light-years from us, and far back in time during the formative years of galaxy birth and evolution.Move over Mars Pathfinder rover. A hardy traveler named Nomad recently set a record by traveling farther than any remotely controlled robot has before over rough territory. The robot's four wheels logged more than 133 miles across Chile's rugged Atacama Desert from June 15 to July 31, during a field experiment designed to prepare for future missions to Antarctica, the Moon and Mars. Scientists from NASA's Ames Research Center, Moffett Field, Calif., and Carnegie Mellon University's Robotics Institute in Pittsburgh performed experiments with Nomad for 45 days, conducting both technology demonstrations and scientific activities. Nomad often worked on its own to avoid obstacles and, in a clear foreshadowing of the future duties of similar robots, it recognized meteorites planted in the desert as a test and may even have found a fossil. The Atacama trek is a quantum leap for the planetary robotics culture, where the historical standard of travel has been yards, not miles, said principal investigator Dr. William Red Whittaker of Carnegie Mellon. Although the 'straightline' distance on a map was only about 13 miles, Nomad had to weave through very difficult terrain, and it made numerous side trips for science and to test the meteorite sensors. It is a pioneer laying a trail toward future planetary robots, which will be challenged for thousands of miles and years of operations, in bold missions like searching for signs of life. The 1,600-pound robot, developed at Carnegie Mellon and funded by NASA, validated the use of color stereo video cameras with human-eye resolution for geology. During different phases of testing, we configured the robot to simulate widearea exploration of the Moon, the search for past life on Mars and for the gathering of meteorite samples in the Antarctic, said Dave Lavery, telerobotics program manager at NASA Headquarters, Washington, DC. Nomad met or exceeded all of our objectives for this project. "We want to give planetary scientists experience using mobile robots, so that they can develop the skills necessary for performing remotely guided investigations," added Dr. David Wettergreen, Nomad project leader at Ames. Nomad is about the size of a small car. Robust robot paving path for future exploration To maneuver through rough terrain, the robot has four-wheel drive and fourwheel steering with a chassis that expands to improve stability and travel over various terrain conditions. Four aluminum wheels with cleats provide traction in soft sand. For this terrestrial experiment, power was supplied by a gasoline generator that enabled the robot to travel at speeds up to about one mile per hour. Nomad drove itself through about 12 miles of the 133 miles it traveled, said Dr. Mark Maimone, Nomad software and navigation lead at Carnegie Mellon. Autonomous driving is critical for planetary exploration because the communications delay between Earth and planets can be many minutes. With autonomous driving, a robot can explore a much greater distance because it doesn't have to wait for a person to decide a safe route. The rover is able to see obstacles and recognize them on its own, he said. El Nio on the InternetWEATHER buffs can get up-to-the-minute information about El Nio, the phenomenon that impacts global weather patterns. Natural disasters such as droughts and floods that wreak widespread havoc on crops, wildlife and human habitations have been traced to El Nio. A new NASA homepage at airsea-www.jpl.nasa.gov/ ENSO.welcome.html provides updated information about NASA's contribution to monitoring this critical weather phenomenon. ABOUT the size of a small car, Nomad is much bigger than the two-foot long Sojourner rover currently exploring the surface of Mars. August 15, 1997 SPACEPORT NEWS Page 6Future. .(Continued from Page 1)reinvest in today, he stated.Four main objectivesThe road map has four main long-term objectives: Assure that sound, safe and efficient practices and processes are in place for privatized/commercialized launch site processing. Increase the use of KSCs unique operational expertise to contribute to the design and development of new payloads and launch vehicles currently in development. Use KSC operational expertise in partnership with other entities such as NASA centers, industry and academia to develop new technologies for future space initiatives. Continually enhance core capabilities (people, facilities, equipment and systems) to meet Agency objectives and customer needs for faster, better, cheaper development and operations of space systems.Add value to Agency, customersKSCs future depends on bringing the most value to where the Agency and our customers are going, Bridges said. We add the most value by our knowledge of operational flight hardware and expertise in processing, integrating, testing and launching space systems. Making the transition to the development role will position Kennedy Space Center to play an active, critical role in the success of future space programs for years to come, he added. But it will mean change, and that produces stress for employees who will have to be retrained, in some cases, or at least rethink how they can contribute to the Centers evolving mission. You cannot do it just because you like to do it. We have to do it because it adds the most value for us and the Agency. We cannot do it just to hold on to jobs. We have to do it because the job is going to be critical to our future, Bridges said. In the near term, senior managers envision that our expertise will be used on ad-hoc design teams for new systems such as Shuttle upgrades and the liquid flyback booster, and test teams for the the X-34, a suborbital, air-launched vehicle now under development. Weve got people here who know more about propellants than anybody else in the world, particularly how to move them around, store them and launch things with them, Bridges said in citing one example of a KSC-unique expertise. The road maps long-term goals for KSC are: Safety and health first; Satisfy customers' needs anytime and anywhere; Advance the fields of space exploration and commerce; Build reliance and teamwork everywhere; Demonstrate environmental leadership.Go where the business isAcknowledging that Florida is not the only space launch site, Bridges said that Center representatives need to take a proactive stance and go to the customer to meet his needs anytime and anywhere. We need to go where the business is, he commented. This is knowledge that were providing, not a Florida experience. Bridges emphasized that senior managers consider the road map to be a living, breathing process, to which details will be added and will change over time. The road map is in line with the Agencys Strategic Plan. The center director spotlighted four examples of projects or programs which illustrate how the Centers role would evolve over the next two-and-a-half decades.CLCS strategyThe Checkout and Launch Control System (CLCS) now under development at KSC will replace the Launch Processing System for the Space Shuttle, and will have the capability to support future launch vehicles. This flexible, expandable system is projected to resultCivil Service work force to move from operations to development role. August 15, 1997 SPACEPORT NEWSPage 7in a 50 percent reduction in operation and maintenance (O&M), console engineers and documentation. It is scheduled to be fully operational by September 2001, and could support X-34 flight tests in FY 1999. In future years, the CLCS could be used for the liquid flyback booster, reusable launch vehicle processing, Mars vehicle development tests and for checkout and launch of other new launch vehicles.Advanced launch system developmentFor the short term (called the Establish a Presence phase), 1997-2002, the plan outlines potential KSC roles in advanced launch systems development as: flying X-34 technology development flights from KSC; advancing the design of the X-33 Mach 15 demonstrator aircraft; and providing launch processing and test expertise for development of future space vehicles. In the mid-term (the Expand Our Horizon period), 2003-2009, the plan envisions that KSC would be used as: a base for reusable launch vehicle flights; a testing area for the Trailblazer and Pathfinder class vehicles; a development base for the Magnum space launch vehicle facilities and operations concepts; and launch site for flights of the Magnum heavy-lift booster. From 2010-2025 (the phase called Develop the Frontier ), the space center could be used to test a new type of space vehicle called a Spaceliner, and to process, test and launch missions to the Moon and Mars if a new exploration initiative is successfully inaugurated by the Administration. We are laying the groundwork so that it is possible to go to Mars within our projected budgets, Bridges said. That requires us to reduce the cost of payloads to orbit by at least an order of magnitude. Partnership in Mars InitiativeKennedy Space Center operations knowledge and expertise could be applied to many requirements of future missions to Mars, according to Bridges. The five initial areas suggested in the road map are: propellant handing and production; habitat and vehicle health management; bioregenerative life support; small fleet logistics; and thermal protection of spacecraft and hardware. We are working to develop partnerships with other centers in these areas, he noted.Consolidate KSC and Air Force operationsUnder the objective of enhancing our core capabilities is the recently announced proposal to consolidate and jointly manage base operations of KSC, Cape Canaveral Air Station, Patrick Air Force Base and the Eastern Test Range. The road map projects the transition to the new contract by Oct. 1, 1998. A cost reduction of 25 percent is anticipated over the life of the 10-year effort. Other joint efforts could produce even more savings and increased access to space for our customers if we are successful with this first initiative, Bridges said.Abolish sacred cowsTo achieve this vision of the future, it will require the abolishment of some sacred cows such as red tape, and excessive documentation and oversight, as well as addressing such concerns as retaining good people, lack of new blood and pricing flexibility, Bridges said. We need to pull together as a Center to do this less stovepiping, more horizontal working across the Center, he urged audience members. We must be more flexible and adaptable, which means pulling expertise from across the Center. This teamwork is required every day, he said. Its going to take the leadership of all of us every day in doing this. This is not some easy thing to do. While exhibiting his enthusiasm for all aspects of the road map during the one-and-a-half-hour presentation, it was clearly the prospect of a human mission to Mars that excited Bridges the most. Im encouraged. Im excited. I think its possible, he enthused. I think it will be our generations failure if we dont do it, so Im going to do everything in my power and use my leadership to encourage all of you to try to help the Agency pull this off. He praised the contributions of KSC dating back to the early days of the space program, adding, I think we can make this work because in my assessment, nobody has contributed more than this group at the Kennedy Space Center. It was 12 years ago today that this team launched me on STS 51-F on the Challenger. I felt very comfortable with this team that day; and I feel the same today because of this passion (you have) for what you do. The road map to the future presentation is on the Web at: http:// roadmap.ksc.nasa.govKSCs future depends on bringing the most value to where the Agency and our customers are going. Center Director Roy Bridges Jr. MOVING to a developmental role: Making the move to a more developmental role is a tough balancing act, Bridges said. We must perform the critical role we have today with the Shuttle and expendable launch vehicles, while creating the new roles which will allow us to build the International Space Station and go on to Mars and beyond. Page 8SPACEPORT NEWS August 15, 1997 John F. Kennedy Space CenterSpaceport News The Spaceport News is an official publication of the Kennedy Space Center and is published on alternate Fridays by the Public Affairs Office in the interest of KSC civil service and contractor employees. Contributions are welcome and should be submitted two weeks before publication to the Media Services Branch, PA-MSB or sent via e-mail to the following SMTP: Paula.Shawa-1@kmail.ksc.nasa.gov Managing editor. . . . . . . . . . . . . . . . Bruce Buckingham Editor. . . . . . . . . . . . . . . . . . . . . . Paula Shawa Editorial support provided by Sherikon Space Systems Inc. Writers Group. Photographic support provided primarily by The Bionetics Corp. and Photographer George Shelton, also of Bionetics.USGPO: 532-112/20053 from space and measuring "ocean color." The color of most of the world's oceans varies with the concentration of phytoplankton, microscopic marine plants that remove carbon dioxide from the atmosphere for internal use. SeaWiFS can view the world's oceans every two days. Since oceans cover 70 percent of the Earth's surface, SeaWiFS will provide information on a large part of the global biosphere. A SeaWiFS launch at this time is particularly important given what appears to be a very intense El Nio event developing in the equatorial Pacific Ocean, said Dr. Charles McClain, SeaWiFS project scientist at NASA's Goddard Space Flight Center. SeaWIFS data will allow us to assess the global impact of El Nio on marine ecosystems, including coastal waters off the U.S. West Coast. SeaWiFS represents a new way of doing business for NASA. The SeaWiFS Team has developed, and will operate, a data system that will process, calibrate, validate, archive, and distribute SeaWiFS data for research. All other aspects of the mission satellite construction, launch, command and control and tracking are the responsibility of Orbital Sciences Corp. NASA has contracted with OSC to provide, for five years, the raw satellite data which will be used for research purposes. OSC will own the data rights for operational and commercial purposes. ACE: The Earth is constantly being bombarded by a stream of accelerated particles arriving not only from the Sun, but also from interstellar and galactic sources. The study of these energetic particles by the ACE observatory will contribute to the understanding of the formation and evolution of the solar system as well as the astrophysical processes involved. While previous missions have studied these particles, the instruments on ACE have a collecting power 10 to 1,000 times greater and will be at least 100 times more sensitive than anything we've ever flown, said Don Margolies, ACE mission manager at Goddard. We will be able to study known phenomena in much greater detail than previously possible and discover new ones to give us a better understanding of the interaction between the Sun, the Earth and the galaxy. ACE has six high-resolution particle detection sensors and three monitoring instruments. ELVs. .(Continued from Page 1)SOLAR panel covers are removed from the SeaStar spacecraft, already mated to the Pegasus-XL rocket at Vandenberg AFB. Launch occurred on Aug. 1. ACE spacecraft, with its solar arrays fully extended, undergoes preflight preparation in the Spacecraft Assembly and Encapsulation Facility-2 at KSC. The 1,730-pound observatory was built by the Johns Hopkins Applied Physics Lab. The science payload was provided under the direction of the California Institute of Technology.It will sample low-energy particles of solar origin and high-energy galactic particles. The observatory will be placed into an orbit at the L1 libration point, which is almost a million miles (or 1.5 million kilometers) away from the Earth, about 1/100 the distance from the Earth to the Sun. The scientific goal of the ACE mission is to measure accurately the composition of several different types of matter, including particles coming from the Sun, the very thin gas between the planets, the even thinner gas just outside the solar system, and matter from distant parts of the galaxy. The particles that ACE measures are moving very fast, up to 3.5 million miles per hour, and are atomic and subatomic. ACE also has an Earth applications goal. It will provide the federal Space Environment Center, Boulder, Colo., with continuous realtime solar wind "space weather" information, which will give an advance warning (about one hour) of geomagnetic storms that can affect electric power grids, Earthorbiting spacecraft, and radio communications on Earth. A third spacecraft, the Lewis Earth-imaging observatory, also was slated for launch this month, but at press time liftoff from Vandenberg was delayed due to a problem with the Lockheed Martin Launch Vehicle (LMLV) that will propel Lewis into orbit.